I have writen about my autumn holidays. I thought, I thought, I thought, and I decided to go Hokkaido again. 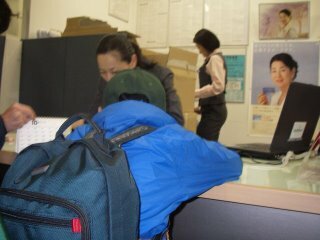 My sons were looking forward to going Hokkaido last Saturday. Goingo n board a ship, taking a shinkansen, and taking a sleeping berth train. But, when we arrived at Sendai, a typhoon came to Hokkaido. The sea was rough, so we couldn’t go on board the ship. Therefore, our tour was canceled. My poor older son was very depressed. (He cried a fron of tour desk.) Of course I was very depressed. I spent a lot of time to plan this trip!! We came back from Sendai last Saturday. Fortunately, the money for the trip was refunded. We could go to Sendai (for) free!! Good to hear that you were not hurt. So it turned out well in the end, it had a happy ending. Phew. Sorry you guys didn't get to make the trip to Hokkaido. Sorry to hear the bad news about your holiday, but am glad that you and your family are safe. Are you able to reschedule? how disappointing. I hope that you managed to have some fun anyway! Actually, it was departing day, my younger son said “I had dream that, I and mother was swimming in the sea last night. I and my older son talked about our trip. And we said, “ We wanted to go Hokkaido.” ……. My younger son is OK. He can’t understand his trip. We went to go somewhere which was nearby. We went to go one day trips. My older son was very disappointed. But we went to Disney Sea Japan on this Friday.